We produced a new company brochure design that gave the sales force a valuable tool to demonstrate the company’s capabilities. 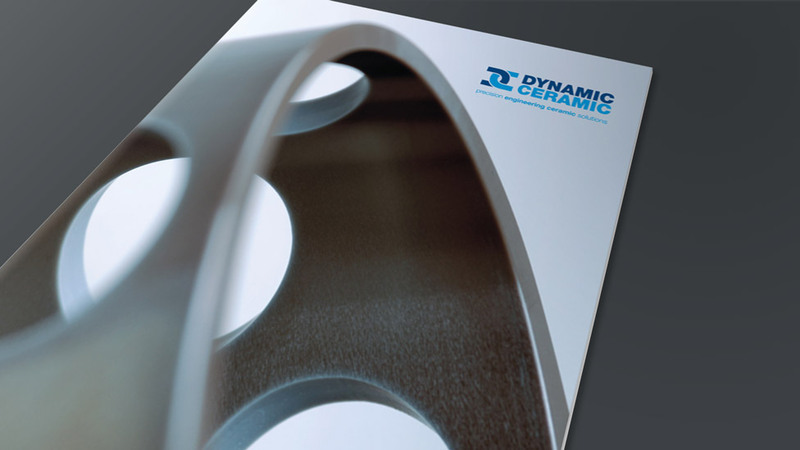 Following the design of their new logo, Dynamic-Ceramic’s next brief was to create a new company brochure to help launch the new brand and give the sales team a valuable promotion tool. The company brochure design had to feature general information about Dynamic-Ceramic, as well as specific information about the varied product range. The solution we created comprised of an oversized A4 8-page brochure containing all the general company information. Integrated into the inside back cover of the brochure was a die cut glued pocket which would take a series of A4 product-specific data sheets. The individual data sheets could then be designed and printed cost-effectively each time they introduced a new product, without requiring the main brochure to be reprinted. To complement the new logo and to bring the brand to life, we developed a photographic style featuring a wide range of components shot in a highly artistic way, creating interesting shapes, graphics and colours, whilst also showcasing Dynamic-Ceramic’s manufacturing capabilities. These product shots were complemented with photographs taken in and around their manufacturing facility. The stunning new brochure was printed onto a heavy weight silk stock, giving a crisp sharp bite to the print and great depth to the photographs. To provide a little protection, increase durability and add a tactile, sophisticated quality, we finished the piece with a matt laminate to the outer cover.